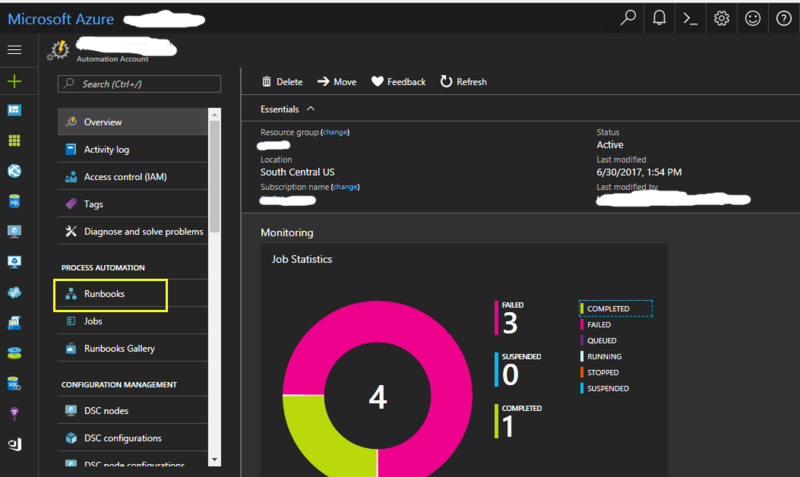 If you’re like me, you’ve probably done some work with SQL Server Agent jobs to schedule backups or other tasks like truncating logs. Since I have a preference to log virtually every action in the applications I build, I end up setting up jobs to truncate or otherwise archive logs after a certain period of time. As the forces of the cloud become ever more pervasive, it leads us to the question of how to schedule these same types of tasks in Azure. Luckily like most things, Microsoft has an answer for this, and it is Azure Automation. 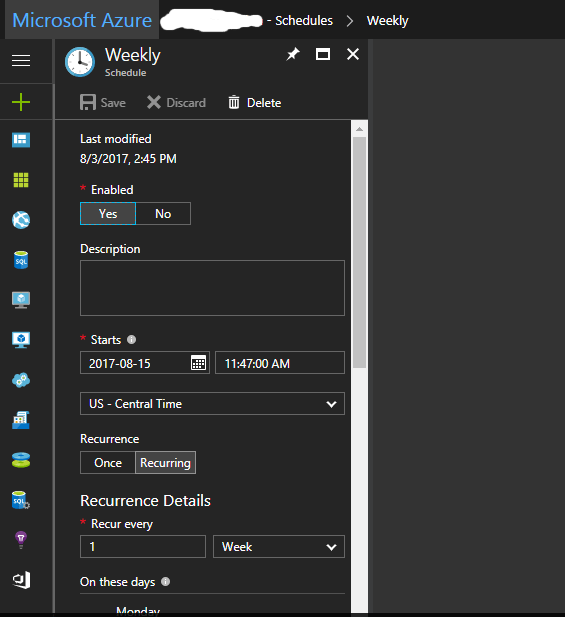 Complete coverage of Azure Automation is outside the scope of this article. For my purposes here, it is suffice to say that Azure Automation is a is a SaaS offering that provides the ability to run Powershell scripts called Runbooks that execute tasks. 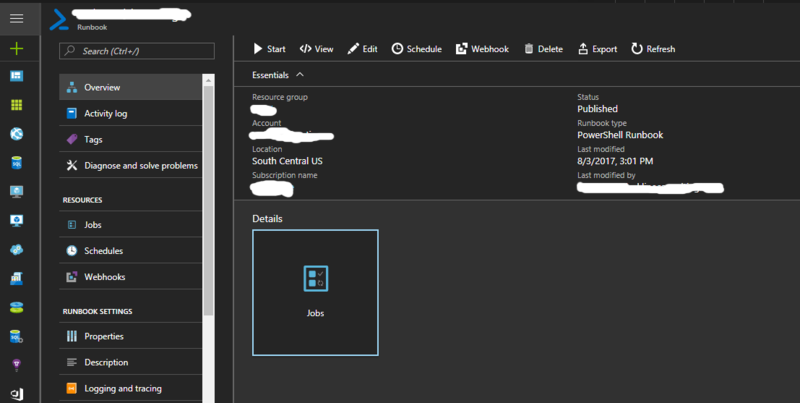 Runbooks can be authored, scheduled and managed all within the Azure portal either through a graphical editor, or by directly editing code. I’ll cover the basics here, that will allow you to author your very own “SQL Server Agent job in the cloud”! We’ll be using the non graphical editing approach. To get started, create your Automation account. There are several prerequisites and permissions that you can read about. Once in the home page for your automation account, select ‘Runbooks’ from the main menu to begin authoring your first Runbook. You’ll then be taken to the landing blade for Runbooks. 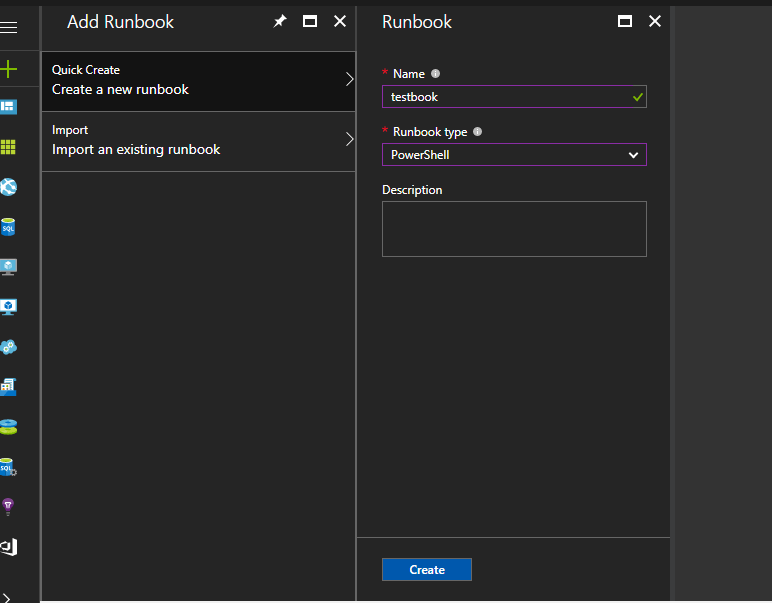 Click ‘Add a runbook’ and follow the steps to create a new Runbook. You have the option here of importing a Runbook as well. I’ll be creating a Runbook of type ‘Powershell’. You can optionally select Graphical Editor or a Workflow type. Once this is created, you’ll be taken back to the Runbooks main blade. Select a Runbook and you’ll be taken to the details blade of that Runbook. Its here from the details blade that we can edit, schedule and publish our Runbook. Select ‘Edit’ to begin editing your Runbook code in your browser. 5. A credential ‘Asset’ that you have to configure separately. This is a user name and password for authenticating against the database server and database. To configure a credential, navigate to the Runbook main blade and follow the steps under the ‘Credentials’ menu. It will allow you to create a saved user name and password. Once you’re done editing your runbook code you can either click ‘Revert to Published’ which will discard your changes and roll back to your published version, if you have already published a script. Or, you can publish the script. Once you publish the script you can run it manually. You can see the results of the last job ran in the details blade of the Runbook, by clicking ‘Jobs’. To attach a schedule to the job, go back to the Runbooks main blade and click ‘Schedules’. Here I’ve created a schedule called ‘Weekly’. I can set the schedule in the edit blade. I then attach the schedule to the job in the details blade of either the Runbook. When you want to run the Runbook manually, click ‘Start’ from the Runbook details blade. You’ll be prompted to provide values for your variables. That’s it. Your job is now able to be scheduled and run. Again, the code I used is modified from the sample here. You could theoretically pass a variable to determine how far back you want to delete the logs in your table.